My favorite restaurant back in California has the most incredible lavender lemonade. My best friend Julie introduced me to it - I was extremely skeptical upon ordering, but it was love at first sip. It tames the tartness of the lemons and adds the most indescribably delicious sweetness. Last time I indulged I made a mental note that once lavender was back in season, I would attempt to make a health conscious version at home. At the restaurant I order it from it's definitely PACKED with sugar, which is unfortunate because this drink can have some incredible health benefits! Lavender is known for reducing anxiety and emotional stress, alleviating headaches, improving sleep, and restoring skin complexion. Lemons boost your immune system, aid digestion, reduce inflammation and help promote weight loss. Honey helps fight bacteria and fungus, reduces ulcers and gastrointestinal disorders, and is chock full of antioxidants. Mix these all together and you got yourself a super powered drink! The only issue here is refined sugar. I debated a long time on the best way to make this sweet without using poisonous/delicious white sugar. Now, I think this specific sweetener I used is exclusive to Europe - which is extremely unfortunate, because it is the bomb (Europe based friends, you can find it by clicking here!) However, it's just a mixture of Stevia and Erythritol - which are found everywhere! Both of them are plant based, zero calories and don't influence blood sugar levels. On the outside, they sound perfect, but the truth is they don't taste like real sugar - UNLESS they're mixed together. Erythritol isn't sweet enough on it's own, and Stevia on its own is TOO sweet with a terrible bitter after taste. But when mixed, the after taste and sweetness are neutralized! Truly, I wouldn't know the difference, it even has a 1:1 ratio for sugar! & if all of this is way too much effort for you, just use 1/4 cup of cane sugar. Easy as pie. Agave nectar might even be nice! I just wanted to maximize the health benefits of this delicious beverage. Now, I was prepared for this recipe to be insanely difficult. I thought there would be a huge amount of trial and error before I even came close. But alas, I nailed this recipe on the first try. If I can do it, ANYONE can. 1) Mix together water and sweetener in a pot, heat to a boil. 2) While boiling, add in honey and lavender sprigs (note: you only want the purple parts! Remove the flowers from the green stems!) Let boil for 5 more minutes, stirring occasionally. 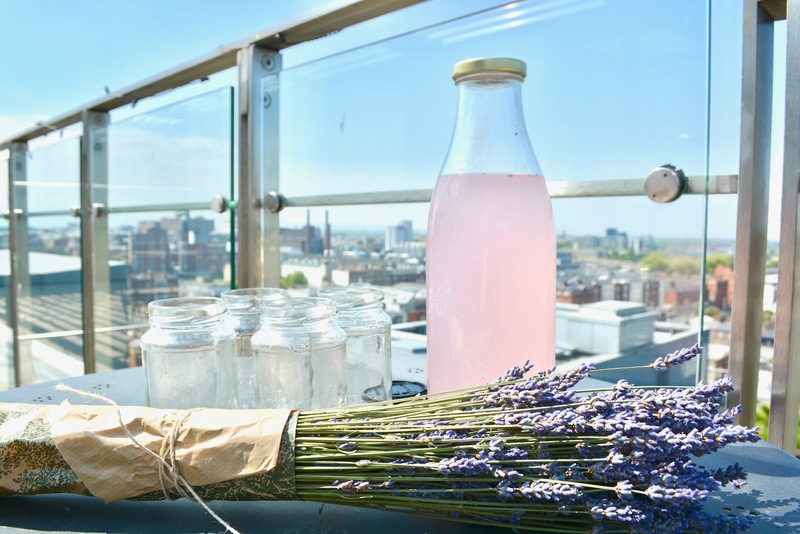 4) Take the lavender syrup off the heat and use a fine tea strainer to strain it into a separate jar, making sure not to get any of big lavender bits into it. 6) Once nice and chilled, remove from the freezer. Fill up a large jar with cold water. 7) Slowly begin to add the lemon juice into the cold water, mixing well as you go. The trick here is to sip the mixture occasionally until you reach the amount of tartness you desire! 8) Repeat step 7 but with the lavender syrup. Stir it in slowly, mixing well and tasting it as you go. You can make it as sweet or as tart as you want! I like my syrup to be potent in the mix, so I use a lot. 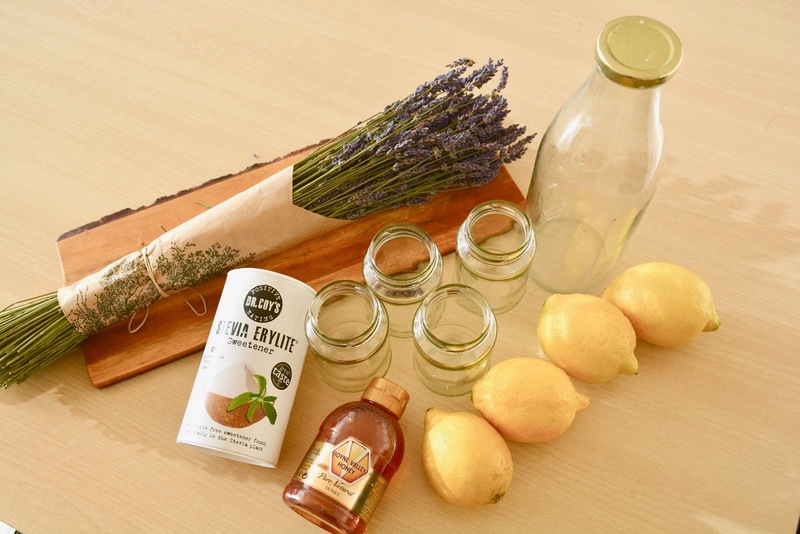 You can easily store the remaining lemon juice and lavender syrup (if you have any!) in the fridge. The syrup will last a LOOONG time, the lemon juice will last a solid month in the fridge and 4-6 months in the freezer. That way you can take them out and whip up a batch whenever you want! 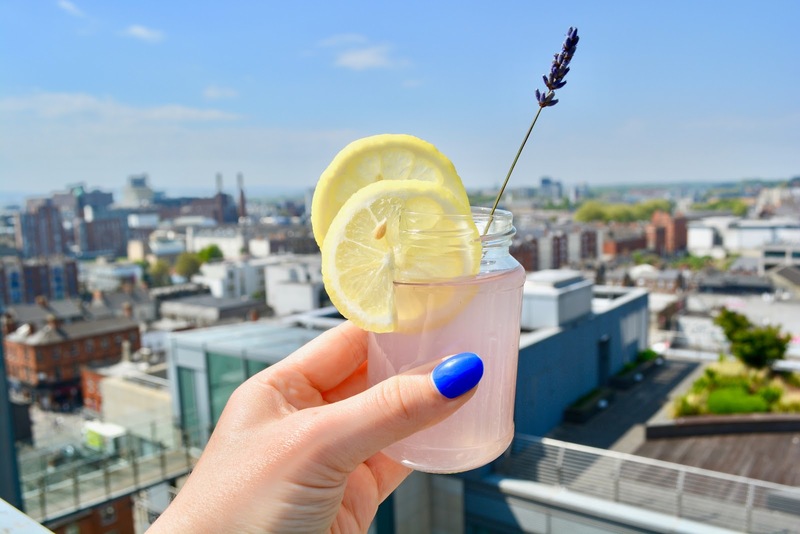 The lavender syrup can be used for a ton of stuff too - lavender cupcakes, cocktails, cookies - all of the good things in the world. Bring on the summer, I'm so ready to serve this on a warm day at a rooftop BBQ!